The promise of iron-fortified food for India: What’s available? For those who have been following the TCi blog posts, you will know that there were several TCi interns working on TCi research and projects this summer. While five worked with the Minimum Nutrition Dataset for Agriculture and were based Hyderabad, I was working on a separate initiative at the Tata Institute for the Social Sciences, or TISS, in Mumbai. My work focused on researching the market-based solutions to iron deficiency. I was fortunate to have the associate director of TCi Bhaskar Mittra to help guide me in my research. The first few weeks at TISS were spent reviewing the literature on iron deficiency throughout India. I utilized government-collected data from the National Sample Survey Organization (NSSO) and the National Family Health Survey (NFHS) to get information. After getting a better understanding of what the national reports say about nationwide nutrient levels, I needed to understand the types of food people were consuming and how they were spending their money. I made trips to three types of food markets in different parts of Mumbai to understand more about urban purchasing behavior and food preferences. While in rural Maharashtra and Gujarat, I spoke with small shop owners to understand what types of food people in rural areas were purchasing. I even learned some typical cooking methods to understand how the way food is prepared could potentially alter nutrition content. Once I had a basic understanding of the context in which I was working, I went back to the list of commercially available iron-fortified foods in India and selected four for in-depth study. The products represented a mix- two packaged snack foods, a widely used consumer product (salt), and a bio-fortified staple food. 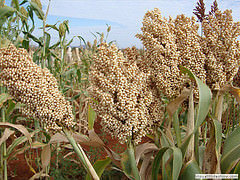 They are: Britannia Tiger Biscuit, Lehar Iron Chusti Puff, Tata Double-Fortified Salt, and Nirmal Seeds ICTP 8203 Fe Pearl Millet (pictured). The remainder of my time in India was spent arranging meetings with the Research and Development departments for each product. I was able to meet with three of the four companies to discuss their products and get more insight into why that product was selected, how effective it would be at addressing iron deficiency, and some basic market strategy. Obviously, since much of the information is confidential, companies were only able to report on so much. The experience culminated in a report showing the information I collected, including a list of known iron-fortified products available in the market, background information on the state of malnutrition and iron deficiency throughout India, and the market information for iron-fortified goods, with the four product case studies. Working with the Tata-Cornell Initiative gave me real research skills while also allowing immersion into another university and culture. After many new experiences, spicy new foods, and countless cups of chai tea, I returned to the US with a fresh understanding of the delicate linkages between market interactions, agriculture and nutrition. The work I did with TCi was an ideal way to bridge the gap between in-class education and engagement with the material itself. I look forward to continuing this research throughout the coming year with Dr. Pingali and the rest of the TCi team.